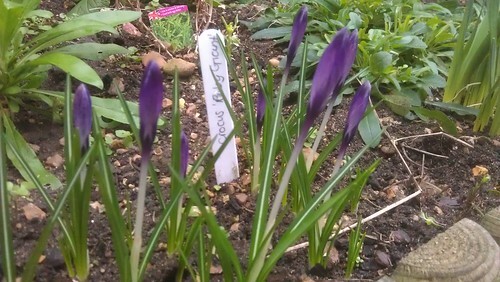 The Crocus ‘Giant Ruby’ bulbs that I planted back in October, are now right on the cusp of opening after months of growing up through the soil – and for a few weeks, snow as well. Some of the Crocus ‘Giant Ruby’ bulbs that have grown and are ready to flower. I planted around 70 bulbs and it would appear that most are doing something. Many have the dash of purple as above, whilst the ones that I planted during November are somewhat behind (I planted them because the Antirrhinums just wouldn’t die!). I’ve seen a few bees around (including a big fat bumble bee inside a Tube train on the District Line of London Underground the other day! ), so hopefully those that have woken early will find these and feed on them – as it’s absolutely crucial for bees to get this early food in order to survive. 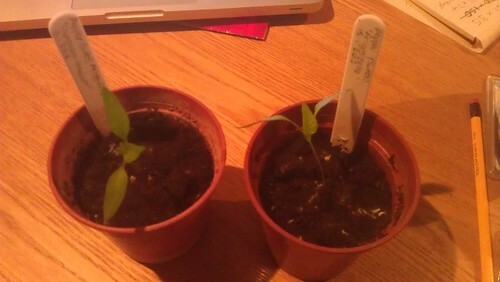 I sowed some seeds back in the middle of January, and these have been busily growing in my propagator. The Sweet Pea ‘Cupani’ have grown very fast and I have been busy nipping out the tips of the plants so that they grow strong and sturdy (and don’t grow too much before i can plant them out). Hopefully these will be far enough ahead that they will survive if/when the aphids swarm again. The Pepper (Sweet) ‘Friggitello’ seedlings have been steadily growing, alongside my second attempt at growing Aubergine ‘Black Beauty’. I have high hopes for these Peppers, and as I sit here typing, I’m reading the packet which describes them as ‘small, very sweet, conical fruits. Perfect for stir-fries’, I’m looking forward to them even more. These should be ready to harvest between July and October (about the same time as the Aubergines) – so they’ve got a while yet. I do believe spring is here! Remove weeds and any dead foliage from the garden. Check up on the Strawberries – the cold weather once again gave them a hammering and I’m not sure how well they’re coping at the moment.